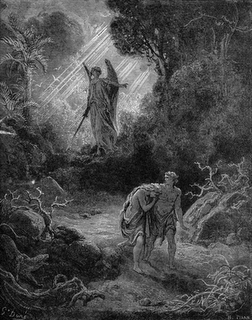 “With respect to the origin of sin in the history of mankind, the Bible teaches that it began with the transgression of Adam in paradise, and therefore with a perfectly voluntary act on the part of man. The tempter came from the spirit world with the suggestion that man, by placing himself in opposition to God, might become like God. Adam yielded to the temptation and committed the first sin by eating of the forbidden fruit. But the matter did not stop there, for by that first sin Adam became the bond-servant of sin. That sin carried permanent pollution with it, and a pollution which, because of the solidarity of the human race, would affect not only Adam but all his descendants as well. As a result of the fall the father of the race could only pass on a depraved human nature to his offspring. From that unholy source sin flows on as an impure stream to all the generations of men, polluting everyone and everything with which it comes in contact. It is exactly this state of things that made the question Job so pertinent, “Who can bring a clean thing out of an unclean? There is not one.” Job 14:4. But even this is not all. Adam sinned not only as the father of the human race, but also as the representative head of all his descendants; and therefore the guilt of his sin is placed to their account, so that they are all liable to the punishment of death. It is primarily in that sense that Adam’s sin is the sin of all. That is what Paul teaches us in Rom. 5:12: “Through one man sin entered into the world, and death through sin; and so death passed unto all men, for that all sinned.” The last words can only mean that they all sinned in Adam, and sinned in such a way as to make them all liable to the punishment of death. It is not sin considered merely as pollution, but sin as guilt that carries punishment with it. God adjudges all men to be guilty sinners in Adam, just as He adjudges all believers to be righteous in Jesus Christ. Thank God for Jesus! Grace and love to you! While I understand that we humans have nothing good to bring the table in this world! And that this world is rather bleak I find comfort in that God loves us. He demonstrated this love by giving us the opportunity to believe in his only son Jesus our Lord and Savior. Boy, are we blessed to have been granted such grace. I am so happy salvation it is not based on what I should do or could, or my past generation did or did not do. It based on faith!